Loss of @ 400 litres of kersosene oil. 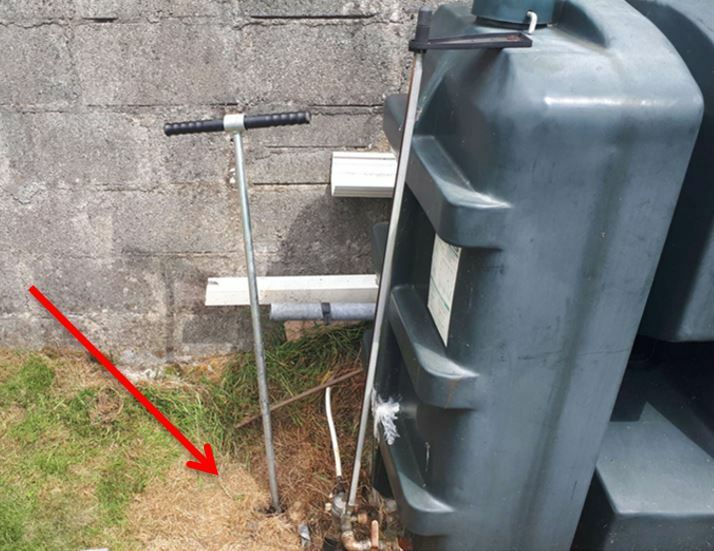 Oil contamination confirmed on soils and fill material in the vicinity of the oil tank adjacent to the east boundary wall at the rear of the property. Strong oil odours and elevated PID readings in excess of 100ppm were recorded in soils and fill material between surface and approximately 2m BGL. Contamination impact to blockwork of the boundary wall. Remaining oil in the leaking tank transferred to a temporary tank on site. Breakout and removal of concrete oil tank base. Removal and disposal of the existing oil tank. Temporary decommissioning of the heating system. Excavation and removal of identified contaminated soil and fill material in the vicinity of the oil tank and partially along the east boundary of the property. Specialised chemical and biological treatment solutions applied to the base and sides of the excavation for a duration of a number of weeks to treat residual contamination. Application of emulsifier to the foundation blockwork and other affected blockwork to the east boundary wall where contamination has been encountered. Reinstatement of the soil and fill materials to ground level. Reinstatement of a new concrete oil tank base in compliance with OFTEC guidelines. Recommissioning of existing heating system in compliance with OFTEC guidelines.